Axons from the visceral motor neurons (vMNs) project from nuclei in the hindbrain to innervate autonomic ganglia and branchial arch-derived muscles. Although much is known about the events that govern specification of somatic motor neurons, the genetic pathways responsible for the development of vMNs are less well characterized. We know that vMNs, like all motor neurons, depend on sonic hedgehog signaling for their generation. Similarly, the paired-like homeobox 2b (Phox2b) gene, which is expressed in both proliferating progenitors and post-mitotic motor neurons, is essential for the development of vMNs. Given that our previous study identified a novel role for the short stature homeobox 2 (Shox2) gene in the hindbrain, and since SHOX2 has been shown to regulate transcription of islet 1 (Isl1), an important regulator of vMN development, we sought to determine whether Shox2 is required for the proper development of the facial motor nucleus. Using a Nestin-Cre driver, we show that elimination of Shox2 throughout the brain results in elevated cell death in the facial motor nucleus at embryonic day 12.5 (E12.5) and E14.5, which correlates with impaired axonal projection properties of vMNs. We also observed changes in the spatial expression of the vMN cell fate factors Isl1 and Phox2b, and concomitant defects in Shh and Ptch1 expression in Shox2 mutants. Furthermore, we demonstrate that elimination of Shox2 results in the loss of dorsomedial and ventromedial subnuclei by postnatal day 0 (P0), which may explain the changes in physical activity and impaired feeding/nursing behavior in Shox2 mutants. Combined, our data show that Shox2 is required for development of the facial motor nucleus and its associated facial (VII) nerves, and serves as a new molecular tool to probe the genetic programs of this understudied hindbrain region. In the hindbrain, motor neuron progenitors are born in a region-specific manner, neighboring the floor plate, in response to their level of exposure to different morphogenetic gradients [1, 2]. These neuronal progenitors differentiate in a rhombomere-specific pattern, which requires the correct spatiotemporal expression of the homeotic (Hox) gene clusters [3–6]. Motor neuron progenitors in the hindbrain can differentiate into somatomotor neurons (sMNs), which innervate the skeletal muscles of the body, or visceromotor neurons (vMNs), which innervate autonomic ganglia (general vMNs) and branchial arch-derived muscles (special vMNs) [3, 7, 8]. Facial (VII) motor neurons, which originate from rhombomeres 4/5, belong to the vMN class of motor neurons. At embryonic day 11.25 (E11.25), facial motor neurons begin to migrate caudally to the pial side of the hindbrain to form the facial motor nucleus, which subsequently segregates into two lobes [6, 9, 10]. Despite the elucidation of the genetic mechanisms that specify sMN identity, the corresponding pathways responsible for the establishment of vMNs are less well understood. Furthermore, even though sonic hedgehog (SHH) signaling is known to be required for the development of all motor neurons [7, 11–15], the upstream regulators of Shh expression and function during late embryonic and early postnatal development, especially within the vMNs of the facial motor nucleus, remain largely unknown . The paired-like homeobox 2b (Phox2b) gene is expressed in both proliferating progenitors and post-mitotic motor neurons and is required for the development of vMNs [17, 18]. Similarly, the homeodomain transcription factor islet1 (ISL1), which is expressed in both post-mitotic sMNs and vMNs, plays a broad role in motor neuron identity and specification [7, 8, 17, 19, 20]. In the absence of Isl1, mice die during embryogenesis around E11.5. This embryonic lethality is associated with an increase in cell death in the hindbrain and neural tube, suggesting that loss of Isl1 function results in the death of cells that were fated to differentiate into motor neurons . In the trigeminal and dorsal root ganglia (DRG), Isl1 appears to play distinct roles during early (i.e. neurogenesis) versus late (i.e. subtype specification) development . In cranial ganglia, Isl1 is required for cell survival and Isl1 mutants show thinner blunted facial (VII) ganglia . However, the precise role of Isl1 in these cell types and in their respective hindbrain nuclei, such as the facial motor nucleus, remains poorly documented. The adult facial motor nucleus contains seven subnuclei; the lateral, dorsolateral, dorsal intermediate, ventral intermediate, dorsomedial and ventromedial nuclei are located within the main nucleus, while the seventh, the dorsal accessory nuclei, is located above the main nucleus [23, 24]. Neurons innervating the nasolabial musculature are located in the lateral facial motor nucleus, while neurons supplying the auricular musculature are located in the medial facial motor nucleus [23, 24]. Together the lateral, intermediate and medial subnuclei comprise 43, 27.1, and 28.7%, respectively, of the motor neurons in the adult facial motor nucleus, with the dorsal accessory nuclei contributing the final 1.2% . Studies with mouse knockout models have shown that Shox2 is required for normal development of the humerus and femur [25–27], the anterior palate , the temporomandibular joint of the jaws , the sinoatrial valves and pacemaker region of the heart [30, 31], and TrkB-positive mechanosensory neurons of the dorsal root ganglia . Most recently, Shox2 has been shown to play an important role in development of the inferior colliculus and cerebellum . We suspected a function for Shox2 during facial motor nucleus development given our previous study demonstrating a novel role for Shox2 in the hindbrain , and since SHOX2 has been shown to regulate transcription of Isl1 , an important regulator of vMN development [7, 8, 19, 22]. In the current study we show that conditional inactivation of Shox2 in the brain results in impaired axonal projections of vMNs and a concomitant loss of medially located neurons in the facial motor nucleus postnatally. Furthermore, we demonstrate that Shox2-mutant neonates display impaired feeding behavior, perhaps due to facial paralysis as a result of improper development and function of the facial nerves. Whole-mount in situ hybridization (WISH) at E11.5 showed Shox2 expression in the trigeminal (V) and facial (VII) ganglia, in addition to the developing maxillary process and mandibular arch (Figure 1a). Shox2 continued to be expressed in the trigeminal (V) ganglia, maxillary process and mandibular arch at E12.5 (Figure 1b). We also visualized the Shox2 expression pattern with a novel Shox2 lacz allele (described in “Methods”). X-gal staining of embryos carrying the Shox2 lacz allele accurately reproduced the endogenous Shox2 expression pattern with increased sensitivity and less background compared to WISH (Additional file 1: Figure S1). At E10.5, Shox2 lacZ/+ embryos showed lacZ staining in the trigeminal (V) and facial (VII) ganglia of the embryo (Figure 1f). Similarly at E11.5, lacZ staining was visible in the trigeminal (V) and facial (VII) nerves of the embryo, in addition to the maxillary process and mandibular arch (Figure 1g). LacZ continued to be expressed in the trigeminal (V) ganglion of the embryonic face from E12.5 to E13.5, and could be seen in the developing pharyngeal arch (Figure 1h, i). At E14.5 lacZ expression was present in the facial mesenchyme that contributes to the maxilla and mandible (Figure 1j). However, from E12.5 onward lacZ staining was no longer observed in the facial (VII) ganglia (Figure 1h–j). Postnatally (P0) lacZ expression was maintained in the facial mesenchyme surrounding the facial (VII) nerves, but not within the axons themselves (Figure 1k). Examination of Shox2 expression early embryonically in the developing brain showed Shox2 staining in a region of post-mitotic neurons adjacent to the floor plate (Additional file 2: Figure S2A–B), a region where Phox2b+/Isl1+ are localized (Additional file 2: Figure S2C–E) . Later in the P0 brain, Shox2 was expressed in the facial motor nucleus (Figure 1c–e). Similarly, in Shox2 lacZ/+ animals, lacZ staining was strongly expressed in both the lateral and medial lobes of the facial motor nucleus (Figure 1l–o); however, staining was not visible within the trigeminal nucleus (Figure 1n, arrowhead). Shox2 mRNA and lacZ expression in the developing embryonic face and postnatal facial motor nucleus. a, b Whole-mount in situ hybridization (WISH) at E11.5 (a) and E12.5 (b) show Shox2 expression in the trigeminal (V) and facial (VII, arrow) ganglia, in addition to the developing maxillary process (mp) and mandibular arch (ma). c–e In situ hybridization (ISH) on whole P0 brains (c, ventral viewpoint) and sagittal (d) or coronal (e) sections through the brain show Shox2 expression in the facial motor nucleus (nVII, arrows). f–j X-gal staining of Shox2 lacZ/+ embryos at E10.5 (f), E11.5 (g), E12.5 (h), E13.5 (i), and E14.5 (j) shows that Shox2 is expressed in the trigeminal and facial ganglion (f, g, arrow), in addition to the developing maxillary process and mandibular arch. Starting at E12.5 and continuing to E14.5, Shox2 expression becomes restricted to the trigeminal ganglion and the facial mesenchyme that will contribute to the maxilla and mandible, however it is absent from the facial ganglia. k–o X-gal staining of Shox2 lacZ/+ pups in the P0 face (k), brain (l, side viewpoint; m, ventral viewpoint) and sagittal (n) or coronal (o) sections through the brain show Shox2 expression in the tissue surrounding the facial nerves (k), with the exception of the nerves themselves, and Shox2 expression in the facial motor nucleus (l–o, arrows). ey eye, nV trigeminal nucleus, sbl superior buccolabial nerve, ibl inferior buccolabial nerve, mm marginal mandibular nerve, cb cerebellum, mb midbrain. Scale bar 500 μm. To determine the functional role of Shox2 in the facial motor nucleus, we used Nestin-Cre  to delete the Shox2 gene conditionally in neural tissue throughout the central nervous system (CNS). We crossed Nestin-Cre; Shox2 +/− mice with Shox2 flox/flox mice  to obtain conditional mutant Nestin-Cre; Shox2 flox/− embryos and neonates. Shox2 expression was eliminated in the brain of Nestin-Cre Shox2-mutant embryos, including the facial motor nucleus (Additional file 3: Figure S3C–D, dashed-circle). All Nestin-Cre Shox2-mutant pups died between 18 to 26 h following birth. This limited our characterization of Shox2 function to embryonic and neonatal stages. P0 Nestin-Cre; Shox2 flox/− mutant pups displayed reduced activity and impaired feeding behavior as early as 6 h following birth (Additional file 4: Movie 1), which correlated with a lack of milk in the stomachs of Nestin-Cre; Shox2 flox/− mutant pups (Additional file 3: Figure S3E, arrows). Since Shox2 is required for the proper development of the palate , we analyzed the anterior and posterior palate of Nestin-Cre; Shox2 flox/− mutant pups. We did not observe any obvious defects or malformations in the palate of Nestin-Cre; Shox2 flox/− mutant pups (Additional file 3: Figure S3F–K), suggesting that the absence of milk in Shox2-mutant neonatal stomachs was not due to cleft palate malformations. Nestin-Cre; Shox2 flox/− mutant pups also displayed tremors 16–26 h following birth (Additional file 4: Movie 1), which could be related to defects in neural circuitry or result from a loss of Shox2 function in other regions of the hindbrain. Since Shox2-mutant neonates displayed impaired feeding but an apparently normal palate, we hypothesized that Shox2 mutants fail to nurse properly due to facial paralysis. To test this hypothesis, we first sought to determine if the abnormal feeding behavior resulted from the loss of a subset of axons in the nerves of the face. We stained control and Nestin-Cre Shox2-mutant embryos and P0 heads with the 2H3 antibody that visualizes nerves by detecting neurofilaments (Figure 2). In E11.5 Nestin-Cre; Shox2 flox/− conditional knockout embryos the trigeminal nerves (V) appeared normal (Figure 2a–b, arrowheads). To confirm that the trigeminal nerves (V) were intact even in the complete absence of Shox2, we performed neurofilament staining on E11.75 Shox2-null embryos (Figure 2c–d, arrowheads) . While the trigeminal nerves (V) remained intact, the facial nerves (VII) were truncated and failed to branch properly in both Nestin-Cre; Shox2 flox/− conditional knockout and Shox2-null embryos (Figure 2a–d, arrows). At E12.5 the facial (VII) nerves continued to be truncated as compared to controls (Figure 2e–h, dashed-box). Neurofilament staining at E12.5 displayed a range in severity of facial (VII) nerve truncation, with Figure 2f showing the least severe truncation and Figure 2h having the most severe truncation we observed among seven embryos. Later at E13.5 (Figure 2i), E14.5 (Figure 2k), and early postnatal (P0; Figure 2m) stages, the zygomatic, superior buccolabial, inferior buccolabial and marginal mandibular nerve branches of the facial (VII) nerve could be seen in controls (Figure 2i, k, m) , however these distinct facial (VII) nerve branches were truncated or absent in Nestin-Cre; Shox2 flox/− mutant animals (Figure 2j, l, n; arrows). Similar to E12.5, facial (VII) nerve truncation ranged in severity at the later embryonic and early postnatal time-points analyzed (data not shown). The severity in facial (VII) nerve truncation observed in Nestin-Cre; Shox2 flox/− mutant animals, displayed in Figure 2j, l, n, are representative of the most common truncations observed. Facial nerve truncations in Shox2-mutant animals. a–d Side view of the E11.5 (a, b) or E11.75 (c, d) face of control (a, c), Nestin-Cre; Shox2 flox/− (b) and Shox2 −/− (d) embryos stained with the 2H3 anti-neurofilament antibody. At E11.5 the main branch of the facial nerve (VII) begins to separate into smaller projections in control embryos (a, arrows), while a single branch is visible in Nestin-Cre; Shox2 flox/− conditional knockout embryos (compare a to b, arrows). At E11.75 the facial nerve is noticeably truncated in the Shox2 −/− embryos (compare c to d, arrows), while the trigeminal nerve (V; a–d, arrowheads) remains intact. e–h Side view of the E12.5 face of control (e) and Nestin-Cre; Shox2 flox/− (f–h) embryos stained with the 2H3 antibody display the range in severity of facial nerve truncation, with f being the least severe truncation and h being the most severe truncation observed in Nestin-Cre; Shox2 flox/− embryos (compare e to f–h, dashed-box). (i–n) Side view of the E13.5 (i, j), E14.5 (k, l) and P0 (m, n) face of control (i, k, m) and Nestin-Cre; Shox2 flox/− (j, l, n) animals stained with the 2H3 antibody. At E13.5 and E14.5 the zygomatic (z), superior buccolabial (sbl), inferior buccolabial (ibl) and marginal mandibular (mm) nerve branches can be seen in control (i, k) embryos but are not visible in Nestin-Cre; Shox2 flox/− (j, l) embryos (compare i to j and k to l, arrows). At P0 the truncated remnants of what appears to be the superior buccolabial nerve were observable in Nestin-Cre; Shox2 flox/− pups (compare m to n, arrows). ey eye, b buccal nerve, sm superficial masseter nerve. Scale bar 500 μm. To confirm the persistent lack of proper facial (VII) nerve branching and development, particularly at late embryonic and early postnatal time-points when the larger head size led to confounding background staining, we used a second transgenic line, this one carrying a bacterial artificial chromosome (BAC) containing the Shox2 gene with a lacZ insertion (previously described BAC RP23-105B3-lacZ transgenic line ) to visualize the facial (VII) nerves. While obvious facial (VII) nerve truncations were difficult to visualize at E11.5 (Figure 3a, b), the main branch of the facial (VII) nerve was noticeably truncated, as the smaller ganglionic projections were absent at E12.5 in Nestin-Cre; Shox2 flox/− mutant embryos as compared to controls (Figure 3c–d, arrow). Furthermore, consistent with our neurofilament staining, at later embryonic (E13.5 and E14.5) and early postnatal (P0) stages, the zygomatic, temporal, superior buccolabial, inferior buccolabial and marginal mandibular nerve branches of the facial (VII) nerve were observed in controls (Figure 3e, g, i) and appeared truncated or absent in Nestin-Cre; Shox2 flox/− mutant animals (Figure 3f, h, j; arrows). For example, by P0 the facial (VII) nerves appeared to be absent in Nestin-Cre; Shox2 flox/− mutant animals (Figure 3j, arrows). The buccal and superficial masseter nerves, both sensory components originating from the trigeminal (V) nerve , were the only nerves visible in Nestin-Cre; Shox2 flox/− mutant animals, leaving the face almost completely devoid of innervation (Figure 3j, arrows). To determine whether the facial (VII) nerve disruptions occurred as a result of the slight reduction in Shox2 expression in the embryonic facial mesenchyme (Additional file 3: Figure S3A–B, arrows), or whether this was related specifically to disruptions in the facial motor nucleus, we conditionally removed Shox2 in all neural crest derivatives using a Wnt1-Cre driver. This resulted in the complete loss of Shox2 expression in the face (Additional file 5: Figure S4A, B), and ultimately did not appear to result in any disruptions to the development of the facial (VII) nerves (Additional file 5: Figure S4C, D). Together these results show impaired axonal projection properties of visceral motor neurons (vMNs) in the facial motor nucleus of the hindbrain in mice lacking Shox2. LacZ staining highlights truncated facial nerves and impaired axonal projection properties of vMNs in mice lacking Shox2 function. a–j BAC RP23-105B3-lacZ transgenic animals stained with X-gal. a, b Side view of the E11.5 face of control (a) and Nestin-Cre; Shox2 flox/− (b) embryos display similar axonal projections of the main branch of the facial nerve (VII) (compare a to b, arrows). c, d Side view of the E12.5 face of control (c) and Nestin-Cre; Shox2 flox/− (d) embryos display facial nerve truncation in mice lacking Shox2 function (compare c to d, arrow). e–h Side view of the E13.5 (e, f) and E14.5 (g, h) face of control (e, g) and Nestin-Cre; Shox2 flox/− (f, h) embryos highlights the zygomatic (z), temporal (t), superior buccolabial (sbl), inferior buccolabial (ibl) and marginal mandibular (mm) nerve branches in control (e, g) embryos, which are truncated or lost in Nestin-Cre; Shox2 flox/− embryos (compare e to f and g to h, arrows). i, j Side view of the P0 face of control (i) and Nestin-Cre; Shox2 flox/− (j) pups demonstrate that the facial nerves are absent in Nestin-Cre; Shox2 flox/− pups (compare i to j, arrows). ey eye, b buccal nerve, sm superficial masseter nerve. Scale bar 500 μm. Since Shox2-mutant embryos and neonates display impaired axonal projection properties and were unable to nurse properly, we next wanted to determine if development of the facial motor nucleus was disrupted in the absence of Shox2. Both neurofilament and lacZ staining of P0 control and Nestin-Cre; Shox2 flox/− or Nestin-Cre; Shox2 lacZ/flox pup brains demonstrated that the facial motor nucleus was severely reduced in size, with disruptions in neuronal spatial organization in mice lacking Shox2 function (Figure 4a–f, arrows; note that the Shox2 lacZ allele is a null or severely hypomorphic allele, see “Methods”). While the symmetry between the left and right facial motor nuclei appears to be relatively maintained (Figure 4c–d, arrows), the two lobes that normally comprise the facial motor nucleus are no longer present (Figure 4e–f, arrows). We next investigated whether an increase in apoptosis could account for the changes observed in the facial motor nucleus of Shox2-mutant brains. We found an increase in the number of apoptotic cells present at E12.5 and E14.5 in the facial motor nucleus of Shox2-mutants (Figure 4g–l); however, no significant increase in apoptosis was detected in the E16.5 or P0 facial motor nucleus of Shox2-mutant animals (Figure 4m–r). We observed a ~7.5-fold increase in the number of cleaved active-CASP3 + cells in the E12.5 facial motor nucleus of Nestin-Cre; Shox2 flox/− animals as compared to controls (Figure 4i; control n = 3, Nestin-Cre; Shox2 flox/− n = 3, p = 0.0038). We also observed a striking ~17.7-fold increase in the number of cleaved active-CASP3 + cells in the E14.5 facial motor nucleus of Nestin-Cre; Shox2 flox/− animals as compared to controls (Figure 4l; control n = 3, Nestin-Cre; Shox2 flox/− n = 3, p = 0.0007). While the slight elevation in apoptosis detected in the E16.5 and P0 facial motor nucleus of Shox2-mutant animals was not significantly different from controls (Figure 4o, r), we did observe a ~3.5-fold increase in the number of cleaved active-CASP3 + cells at P0 when we included the tissue immediately surrounding the facial motor nucleus of Nestin-Cre; Shox2 flox/− animals (Figure 4p–q, entire panel including cells within the dashed-circle) in our cell count (Figure 4s; control n = 3, Nestin-Cre; Shox2 flox/− n = 3, p = 0.0007). Moreover, when we calculated the area of Shox2lacZ + cells remaining in sagittal sections through the center of the facial motor nucleus of Nestin-Cre; Shox2 lacZ/flox animals as compared to controls at E14.5 (Figure 4t) and P0 (Figure 4u), we observed a ~44% decrease in the area of Shox2lacZ + cells in the E14.5 facial motor nucleus (Figure 4v; control n = 3, Nestin-Cre; Shox2 lacZ/flox n = 3, p = 0.0027) and a ~53% decrease in the area of Shox2lacZ + cells in the P0 facial motor nucleus (Figure 4w; control n = 3, Nestin-Cre; Shox2 lacZ/flox n = 3, p = 0.0011). Therefore, the higher levels of apoptosis are correlated with a decrease in the size of the facial motor nucleus, and taken together, the results demonstrate that apoptosis contributes to the disruptions observed in the facial motor nucleus of Nestin-Cre; Shox2 flox/− animals. Nestin-Cre driven conditional Shox2-deletion results in disruptions in the facial motor nucleus and changes in cell death. a, b Ventral view of the P0 brain of control (a) and Nestin-Cre; Shox2 flox/− (b) animals stained with the 2H3 antibody demonstrate that the facial motor nucleus (nVII) is severely reduced in Nestin-Cre; Shox2 flox/− pups (compare a to b, dashed-circle and arrows). c–f X-gal staining of P0 control (c, e) and Nestin-Cre; Shox2 lacZ/flox (d, f) pup brains (viewed ventrally) show Shox2 expression in the facial motor nucleus and demonstrate that the nucleus is severely reduced in size (compare e to f, arrows) in mice lacking Shox2 function. Cleaved active-CASP3 immunostaining on E12.5 (g, h), E14.5 (j, k), E16.5 (m, n) and P0 (p, q) control (g, j, m, p) and Nestin-Cre; Shox2 flox/− mutant (h, k, n, q) sagittal sections through the facial motor nucleus (nVII). i Quantification of the number of cleaved active-CASP3 + cells present in the E12.5 facial motor nucleus (see g, h) of control and Nestin-Cre; Shox2 flox/− embryos (plotted values are the mean ± S.E.M, 3 sections per animals, n = 3 animals, p = 0.0038). l Quantification of the number of cleaved active-CASP3 + cells present in the E14.5 facial motor nucleus (see j, k) of control and Nestin-Cre; Shox2 flox/− embryos (plotted values are the mean ± S.E.M, 3 sections per animals, n = 3 animals, p = 0.0007). o Quantification of the number of cleaved active-CASP3 + cells present in the E16.5 facial motor nucleus (see m, n) of control and Nestin-Cre; Shox2 flox/− embryos (plotted values are the mean ± S.E.M, 3 sections per animals, n = 3 animals, p = 0.1929). r Quantification of the number of cleaved active-CASP3 + cells present in the P0 facial motor nucleus (see p, q, dashed-circle) of control and Nestin-Cre; Shox2 flox/− embryos (plotted values are the mean ± S.E.M, 3 sections per animals, n = 3 animals, p = 0.6875). s Quantification of the number of cleaved active-CASP3 + cells present in and around the P0 facial motor nucleus (see p, q, entire panel including cells within the dashed-circle) of control and Nestin-Cre; Shox2 flox/− embryos (plotted values are the mean ± S.E.M, 3 sections per animals, n = 3 animals, p = 0.0007). t, u Representative binary particle area diagrams from ImageJ displaying Shox2lacZ + cell staining at E14.5 (t) and P0 (u) in controls and NestinCre; Shox2 lacZ/flox facial motor nuclei. v Quantification of the area of Shox2lacZ + cells present in sagittal sections through the center of the E14.5 facial motor nucleus (see t) of control and Nestin-Cre; Shox2 lacZ/flox embryos (plotted values are the mean ± S.E.M, control = 3, Nestin-Cre; Shox2 lacZ/flox = 3, p = 0.0027). w Quantification of the area of Shox2lacZ + cells present in sagittal sections through the center of the P0 facial motor nucleus (see u) of control and Nestin-Cre; Shox2 lacZ/flox animals (plotted values are the mean ± S.E.M, control = 3, Nestin-Cre; Shox2 lacZ/flox = 3, p = 0.0011). cb cerebellum. a–f Scale bar 500 μm. g–q Scale bar 250 μm. Given the marked reduction in size of the facial motor nucleus in Shox2 mutants (Figure 4), we next sought to investigate whether factors other than facial (VII) nerve truncation and cell death could be changing in the facial motor nucleus following the loss of Shox2. Prior to E14.5, we did not observe any obvious changes in gene expression or disruptions to the migratory patterns of vMNs (Additional file 2: Figure S2F-K, M-R). At E14.5, however, sagittal sections of the facial motor nucleus showed reductions in the overall size of the nucleus in Nestin-Cre; Shox2 lacZ/flox embryos (Figure 5b), which was consistent with the regional increase in the number of cleaved active-CASP3 + cells at this time-point (Figure 4k). Since SHOX2 has been previously shown to regulate Isl1 , an important regulator of vMN development [7, 19, 22], we next examined the expression of Isl1 in Shox2-mutant animals. We observed a regionally restricted loss of Isl1 and the hindbrain vMN determinant Phox2b in the facial motor nucleus as early as E14.5 in Nestin-Cre; Shox2 flox/− mutant embryos as compared to controls (Figure 5e–h, arrows). Since loss of Isl1 function in the trigeminal and DRG have been shown to result in changes in the expression of contactin 2 (Cntn2), tubulin β-3 chain (Tubb3) and peripherin 1 (Periph) , and given that Phox2b-deficient mice have been used to identify the facial motor nucleus as a source of Slit homolog 2 (Slit2) signaling , we next examined the expression patterns of these genes. Although subtle changes in the spatial patterns and expression levels of Cntn2 and Tubb3 were observed, Periph1, solute carrier family 18 (Slc18a3) and Slit2 phenocopied the regionally specific absence of Isl1 and Phox2b in the facial motor nucleus at E14.5 in Nestin-Cre; Shox2 flox/− mutant embryos (Figure 6i–r, dashed-circle and arrows). The changes in expression for these genes continued to be observed between Nestin-Cre; Shox2 flox/− mutant embryos and controls at E16.5 (data not shown). Together, these results show that Shox2 is required for normal expression of markers of vMN identity at E14.5. Loss of Shox2 in the brain results in subtle changes in the expression pattern of Isl1 and Phox2b in the E14.5 facial motor nucleus. a Diagram of a sagittal section through the E14.5 brain highlights the regions represented in b–r. b X-gal stained sagittal sections through E14.5 embryos shows decreased staining in the facial motor nucleus (nVII) of Nestin-Cre; Shox2 lacZ/flox (B″) embryos that lack Shox2 function, as compared to controls (B′). c–r ISH on E14.5 control (c, e, g, i, k, m, o, q) and Nestin-Cre; Shox2 flox/− (d, f, h, j, l, n, p, r) sagittal sections shows loss of Shox2 expression (compare c to d, dashed-circle), and subtle changes in the spatial expression patterns of Isl1 (compare e to f, arrow), Phox2b (compare g to h, arrow), Cntn2 (compare i to j, dashed-circle), Tubb3 (compare k to l, dashed-circle), Periph (compare m to n, arrow), Slc18a3 (compare o to p, arrow) and Slit2 (compare q to r, arrow) in the developing facial motor nucleus. The dashed-circles in paired panels being compared (e.g. B′ and B″) are the same size, and this applies from B′ to r. Scale bar 250 μm. Shox2 is required for the proper development of the facial motor nucleus. a Diagram of a sagittal section through the P0 brain highlights the regions represented in b–v. b X-gal stained sagittal sections through P0 brains show a decrease in staining levels in the facial motor nucleus (nVII) of Nestin-Cre; Shox2 lacZ/flox (B″) animals as compared to controls (B′). c–v ISH on P0 control (c, e, g, i, k, m, o, q, s, u) and Nestin-Cre; Shox2 flox/− (d, f, h, j, l, n, p, r, t, v) sagittal sections shows loss of Shox2 expression (compare c to d, dashed-circle), and decreases in Isl1 (compare e to f, dashed-circle), Phox2b (compare g to h, dashed-circle), Cntn2 (compare i to j, dashed-circle), Tubb3 (compare k to l, dashed-circle), Periph (compare m to n, dashed-circle), Slc18a3 (compare o to p, dashed-circle), Slit2 (compare q to r, dashed-circle), Shh (compare s to t, dashed-circle) and Ptch1 (compare u to v, dashed-circle) expression in the facial motor nucleus. nV trigeminal nucleus, RTN retrotrapezoid nucleus. Scale bar 250 μm. In contrast to the subtle changes at E14.5, postnatally we observed a drastic reduction in the size of the facial motor nucleus and changes to the overall organization of motor neurons in Nestin-Cre; Shox2 flox/− mutant animals (Figure 6), consistent with the phenotype displayed in Figure 4. Specifically, lacZ staining of P0 control and Nestin-Cre; Shox2 lacZ/flox sagittal sections of the facial motor nucleus demonstrate that the nucleus is reduced in size in mice lacking Shox2 (Figure 6b). The expression levels of Isl1, Phox2b, Cntn2, Tubb3, Periph, Slc18a3 and Slit2 were all strikingly reduced in the P0 facial motor nucleus of Nestin-Cre; Shox2 flox/− mutant animals as compared to controls (Figure 6e–r, dashed-circle). Since conditional inactivation of Shox2 in the brain was previously shown to result in the down-regulation of Shh expression in dorsal-residing Purkinje cells of the cerebellum , we next investigated whether loss of Shox2 function in the facial motor nucleus interfered with the expression of Shh. The expression of both Shh and patched 1 (Ptch1) were absent in the facial motor nucleus of Nestin-Cre; Shox2 flox/− mutant animals (Figure 6s–v). Although the loss of Shox2 in the brain resulted in drastic reductions in the size of the facial motor nucleus and the expression of the above-mentioned genes, the spared vMNs remaining in the facial motor nucleus of Shox2 mutants appeared to be mostly localized to the dorsal regions of the nucleus (Figure 6B″, f, n). This suggested that there could be a region-specific loss of distinct subnuclei in the facial motor nucleus in Shox2-mutant animals. Therefore we examined the expression patterns of these same genes in coronal sections of the facial motor nucleus, as this would allow us to more clearly observe the six subnuclei that comprise the main facial motor nucleus; specifically the lateral, dorsolateral, dorsal intermediate, ventral intermediate, dorsomedial and ventromedial nuclei [23, 24]. LacZ staining of P0 control and Nestin-Cre; Shox2 lacZ/flox coronal sections of the facial motor nucleus demonstrated that elimination of Shox2 resulted in the loss of medially-localized subnuclei, specifically the dorsomedial and ventromedial nuclei, in addition to severe disruptions to the development of the intermediate nuclei, especially the dorsal intermediate (Figure 7b). Similar to what we observed at P0 in sagittal sections of the facial motor nucleus (Figure 6), the expression of Isl1, Phox2b, Cntn2, Tubb3, Periph, Slc18a3, Slit2, Shh and Ptch1 were restricted to the lateral or intermediate regions in coronal sections of the facial motor nucleus, or completely lost in Nestin-Cre; Shox2 flox/− mutant animals as compared to controls (Figure 7e–v, dashed-circle). While the regional changes in expression were variable between the genes examined, in general the dorsomedial, ventromedial and dorsal intermediate subnuclei of the facial motor nucleus appeared to be most strongly affected in Shox2-mutant animals (Figure 7), which may reflect a regional specific requirement for Shox2 in the facial motor nucleus or may indicate that there are populations of vMNs within the facial motor nucleus that do not express Shox2 during development. Together, the results suggest that Shox2 is required for the development of specific subcompartments within the broader facial motor nucleus. Loss of Shox2 function in the facial motor nucleus interferes with the proper development of the medial subnuclei. a Diagram of a coronal section through the P0 brain highlights the region represented in panels b–v, particularly the 7 neuronal clusters that form the facial motor nucleus (nVII, dashed-circle) (image adapted from ). b X-gal stained coronal sections through P0 brains shows a loss of medial neuronal clusters in the facial motor nucleus of Nestin-Cre; Shox2 lacZ/flox (B″) brains as compared to controls (B′). c–v ISH on P0 control (c, e, g, i, k, m, o, q, s, u) and Nestin-Cre; Shox2 flox/− (d, f, h, j, l, n, p, r, t, v) coronal sections shows loss of Shox2 expression (compare c to d, dashed-circle), and decreases in Isl1 (compare e to f, dashed-circle), Phox2b (compare g to h, dashed-circle), Cntn2 (compare i to j, dashed-circle), Tubb3 (compare k to l, dashed-circle), Periph (compare m to n, dashed-circle), Slc18a3 (compare o to p, dashed-circle), Slit2 (compare q to r, dashed-circle), Shh (compare s to t, dashed-circle) and Ptch1 (compare u to v, dashed-circle) expression in the facial motor nucleus. DA dorsal accessory, DM dorsomedial, VM ventromedial, DI dorsal intermediate, VI ventral intermediate, DL dorsolateral, Lat lateral. Scale bar 250 μm. In this study, we used a Nestin-Cre driver and a conditional knockout strategy to determine the contribution of Shox2 to the development of the facial motor nucleus. We found that mice lacking Shox2 function failed to develop proper vMNs in the medial subnuclei normally present in the facial motor nucleus, which was accompanied by truncated or absent facial (VII) nerve projections. Our results have uncovered an unexpected and novel role for Shox2 in the development of the facial motor nucleus and facial (VII) nerves. Specifically, Shox2 is required for cell survival and perhaps plays a region-specific role in the development and/or maintenance of normal transcriptional programs of vMNs of the facial motor nucleus. Ultimately, in the absence of Shox2, pups lack facial (VII) nerves and display abnormal feeding behavior. Nestin-Cre-mediated deletion of Shox2 in the brain resulted in a significant increase in the number of apoptotic cells present at E12.5 and E14.5 in the facial motor nucleus of Shox2-mutants. Given that truncated and abnormal facial (VII) nerve projections could be observed in Nestin-Cre; Shox2 flox/− mutants from E11.5 onward, apoptosis could: (1) contribute to the disruptions in the axonal projection properties of vMNs in the facial motor nucleus, or (2) result from a lack of peripheral trophic support for the facial (VII) nerves in Shox2 mutants. Similarly, the changes observed in the size of the P0 facial motor nucleus also likely results from elevated cell death embryonically in Shox2-mutant animals. However, given that there are ~6,400 neurons that comprise the facial motor nucleus [23, 24], future analysis is needed to quantify cell death accurately over a developmental time course to determine if the levels of cell death we observe in Shox2-mutant animals is sufficient to account for the disruptions observed in the facial motor nucleus in the absence of Shox2. This is similar to what has been documented in Isl1 mutants, as loss of Isl1 is associated with increased cell death in the trigeminal, DRG, hindbrain and neural tube prior to E14.5, while later developmentally Isl1 functions during subtype specification [19, 21, 22, 38]. Accordingly, if Shox2 is required to maintain proper Isl1 expression in vMNs of the facial motor nucleus, similar to what has been observed during heart development , and Isl1 is required to induce the subsequent differentiation of adjacent neurons, similar to what has been observed in the neural tube , this could explain the elevated cell death observed in neurons adjacent to the facial motor nucleus at P0. Pattyn et al. have shown that unlike PHOX2B and ISL1, NKX6 proteins (NKX6.1 and NKX6.2) are not required for the establishment of vMN identity, yet NKX6 proteins are necessary to prevent vMNs from trans-differentiating into improper neuronal subtypes. Similar to Shox2 mutants, mice lacking Nkx6 function display impaired axonal projection properties of vMNs and facial nerve disruptions . Together, the Shox2-mutant model could provide an additional example to support the argument of Pattyn et al. that vMN differentiation requires multiple inputs rather than one dominant determinant . Alternatively, necrosis in the facial motor nucleus region could be responsible for the observed ectopic increase in the number of apoptotic cells in tissue immediately surrounding the facial motor nucleus. In this study we have shown that Shox2 is expressed in the facial motor nucleus and provide evidence that Shox2 plays an important role during facial motor nucleus development. We have demonstrated that loss of Shox2 function results in the down-regulation or loss of Isl1, Phox2b, Cntn2, Tubb3, Periph, Slc18a3 and Slit2 in the facial motor nucleus. Since loss of Isl1 function in the trigeminal and DRG have been shown to result in changes in the expression of Cntn2, Tubb3 and Periph , and given that Phox2b-deficiency influences Slit2 expression , we propose that the observed changes in gene expression in Shox2 mutants could result from direct or indirect regulation of Isl1 and/or Phox2b by SHOX2. Since Isl1 can rescue Shox2-mediated bradycardia, and Isl1 has been shown to be a transcriptional target of SHOX2 in vitro , it would not be surprising if SHOX2 regulates Isl1 in the facial motor nucleus. As conditional inactivation of Shox2 in the brain was previously shown to result in the down-regulation of Shh expression in dorsal-residing Purkinje cells of the cerebellum , we also investigated whether loss of Shox2 function in the facial motor nucleus interfered with expression of Shh. Similar to what was observed in the cerebellum, the expression of both Shh and Ptch1 were reduced or lost in the facial motor nucleus of Shox2-mutant animals, suggesting that Shox2 acts upstream of SHH signaling, or that the neurons that would normally express Shh underwent apoptosis earlier embryonically in Shox2-mutant animals. Despite the known critical function of Shh in motor neuron generation [7, 11–15], the role of Shh in the later development of the vMNs of the facial motor nucleus remains largely unknown. In rats, SHH appears to play a role in the regeneration of the facial motor nucleus and facial (VII) nerves following nerve injury . Therefore, as the facial motor nucleus normally undergoes massive cell death from E19 to P10 , the late-onset of Shh expression in the facial motor nucleus could be localized to specific vMNs for cell survival. This hypothesis will be tested in future studies. Together, it appears that Shox2 is necessary for proper Isl1 and Phox2b expression levels in the developing facial motor nucleus, and is subsequently required for late-onset Shh expression; whether this results from facial (VII) nerve disruption and embryonic apoptosis in Shox2 mutants or occurs via direct or indirect regulation of Isl1, Phox2b and/or Shh has yet to be determined. Since the phenotype observed in the facial motor nucleus of Shox2 mutants, including the changes in gene expression, were most prominent in the medial and intermediate subnuclei, factors other than SHOX2 must contribute to the development and survival of the lateral subnuclei of the facial motor nucleus. The observed phenotype could reflect a regional specific requirement for Shox2 in the facial motor nucleus or indicate that there are populations of vMNs within the facial motor nucleus that do not express Shox2. The latter hypothesis is supported by results depicted in Figure S2F, H, J, as the Shox2 expression domain appears more restricted then those of Isl1 and Phox2b; therefore, future analysis will be required to examine whether SHOX2−/ISL1+ and/or SHOX2−/PHOX2B+ cell populations exist in the facial motor nucleus. Alternatively, if vMNs destined for the lateral subnuclei of the facial motor nucleus are specified first, this could explain why they are the least disrupted group of nuclei apparent in Shox2 mutants. However, considering the severe disruptions to facial (VII) nerve development observed in Shox2 mutants, including those that innervate the nasolabial musculature that are supplied by neurons located in the lateral subnuclei of the facial motor nucleus [23, 24], it is also possible that Shox2 is required for the proper development of the lateral facial motor nuclei. This is further supported by changes in the expression of Cntn2, Tubb3, Shh and Ptch1 in the lateral facial motor nucleus. Taken together, it appears that Shox2 may play a role in the transcriptional programs of vMNs during development of the facial motor nucleus; whether this occurs via a regional requirement for Shox2 in the facial motor nucleus or influences the development of the entire facial motor nucleus in an equal manner has yet to be determined. As Shox2-mutant neonates display impaired feeding behavior, we wondered if this was due to a loss of a subset of axons in the nerves present in the face or whether it reflected a more substantial innervation deficit. 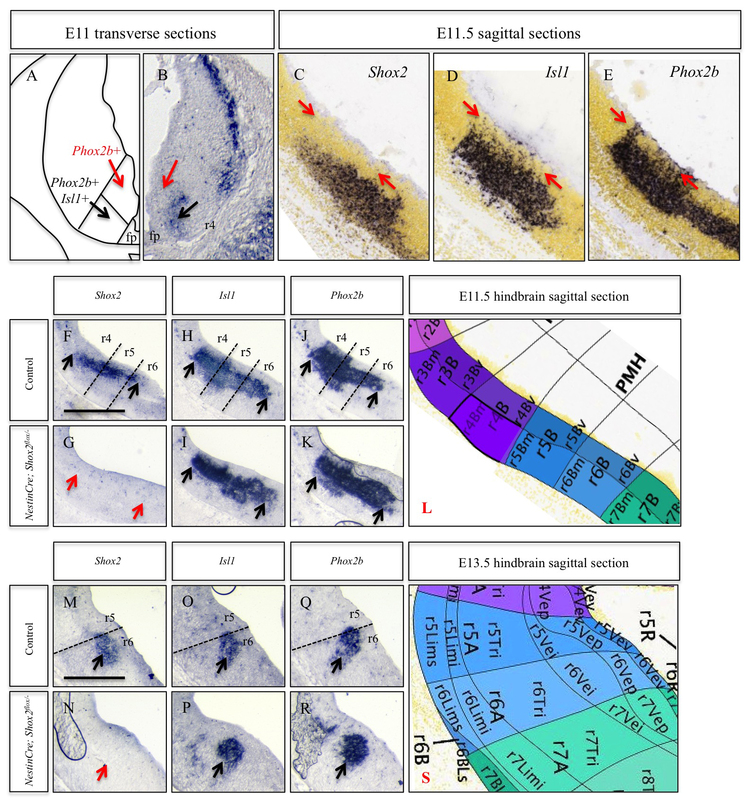 Our findings demonstrate that the loss of Shox2 causes severe truncations and disruptions to the development of the facial (VII) nerves, which could result from: (1) a lack of peripheral trophic support for the facial (VII) nerves, (2) vMN cell death, (3) facial motor nucleus defects that influence the axonal projections of vMNs and target acquisition of the facial (VII) nerves, or a combination thereof. It should be mentioned, however, that disruptions in peripheral trophic support for the facial (VII) nerves would have to result from Shox2’s autonomous function in the facial (VII) nerves themselves, and not as a result of Shox2 playing a role as a peripheral target, since loss of Shox2 expression in the face in Wnt1-Cre; Shox2 flox/− mutant animals does not disrupt facial (VII) nerve development. Given that the face of Shox2-mutant neonates are severely devoid of innervation, the behavioral abnormalities exhibited by Shox2-mutant animals could be attributed to facial paralysis. Disruption of Hoxb1 function has been shown to result in facial nerve defects in mice, where the phenotype is similar to that of human patients with Bell’s Palsy or Moebius Syndrome . Similarly, other Hox-mutant mouse models have displayed disruptions in facial (VII) nerve development, which correlate with facial impairments . Moreover, Isl1 mutants display disruptions in the development of the facial (VII) nerves, however similar to Shox2 mutants, early postnatal lethality has limited the behavioral analysis of these animals [21, 22, 38]. To determine if disruption to the facial motor nucleus is the cause of the early postnatal lethality of Nestin-Cre; Shox2 flox/− animals, future studies could employ more restricted hindbrain Cre lines to specifically remove Shox2 expression from the facial motor nucleus. If regionally restricted loss of Shox2 in facial motor nucleus does not result in postnatal lethality, future studies could examine Shox2-mutant behavior later postnatally and in the adult to test whether Shox2-mutant animals have control over their face or are experiencing facial paralysis. 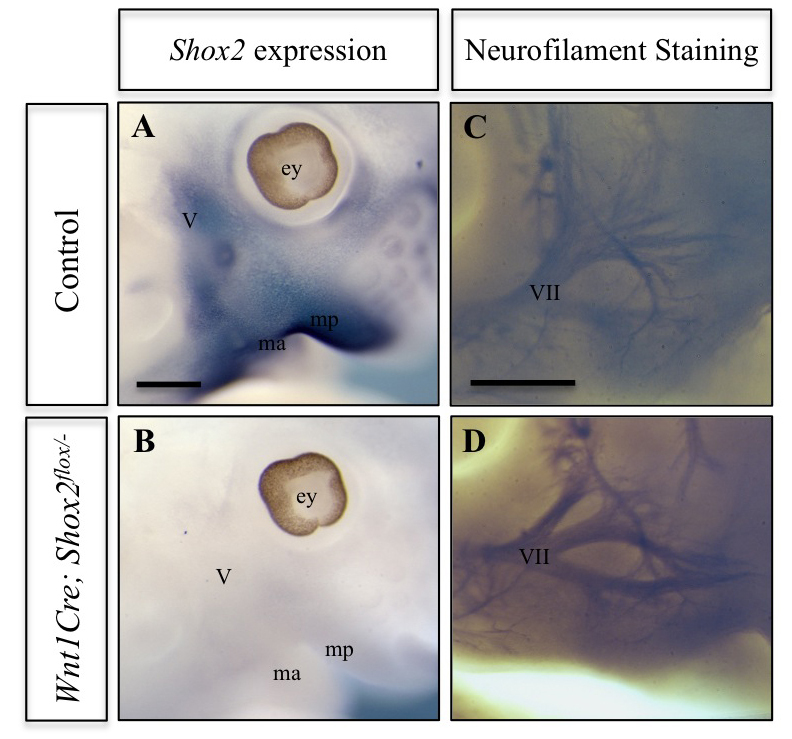 Taken together, these results demonstrate that elimination of Shox2 in the brain results in disruptions in the development of the facial (VII) nerves and the facial motor nucleus. The present study demonstrates that in the absence of Shox2 the murine face develops with severe innervation deficits, ultimately highlighting the importance of Shox2 to proper facial motor nucleus development. The Shox2-mutant model can now be exploited to further our understanding of normal neuronal development and circuit formation; processes that are likely dysregulated in human facial paralysis disorders. To generate conditional Shox2 knockout animals, mice bearing the Nestin-Cre transgene , in addition to a wild-type and deleted Shox2 allele, were crossed to mice carrying two floxed Shox2 alleles . Shox2 mutants were positive for Nestin-Cre and carried one deleted and one floxed Shox2 allele. Littermate control animals carried either one or two functional copies of Shox2, as no changes in the gross morphology of the facial motor nucleus or facial nerves were observed in heterozygotes. We designated embryonic day 0.5 (E0.5) to be noon on the day a plug was detected. Mice were maintained on a mixed C57BL/6-129/Sv background. Mice carrying the deleted and floxed Shox2 alleles were described previously , while mice carrying the Nestin-Cre transgene were from the Jackson Laboratory (Bar Harbor, ME), and described previously . BAC RP23-105B3-lacZ transgenic animals were described previously , while Shox2 lacZ mice are described below. All experiments performed at the University of Calgary were approved by the Life and Environmental Sciences Animal Care Committee. Experiments were conducted on three embryos or neonates of a particular genotype at each gestational and postnatal time point described, unless otherwise stated. Shox2 lacZ mice were produced by pronuclear injection of a 15.4 kb NarI fragment (Additional file 1: Figure S1A) of BAC RP23-103D17-lacZ that has a lacZ cassette inserted in the Shox2 gene as previously described . One of seven transgenic lines carrying this transgene showed an unexpected expression pattern that recapitulated all of the expression domains of the endogenous Shox2 gene (compare Additional file 1: Figure S1D–S1E), despite evidence that the regulatory regions controlling expression in most of these domains is not within the transgene sequence . This result suggested that the transgene in this line, designated Shox2 lacZ may have inserted into the Shox2 locus. Although rare, targeting of transgenic constructs generated by pronuclear injection has been reported [41, 42]. We confirmed a loss of Shox2 function by a complementation test and targeting was shown by long range PCR (Additional file 1: Figure S1B). For the former, the Shox2 lacZ allele was combined with the Shox2 − allele. 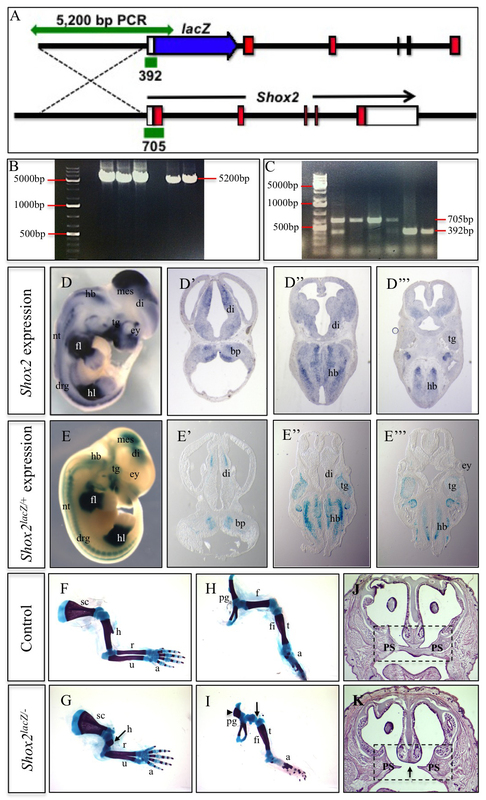 Mice with the genotype Shox2 lacZ/− died at birth with defects similar to Shox2 null animals, showing non-complementation (the limb and palate phenotypes are shown in Additional file 1: Figure S1F–K, respectively). Long-range PCR was performed with a forward primer corresponding to a sequence 4.5 kb upstream of Shox2 (327 bp upstream of the 5′ limit of the transgene) and a reverse primer within the lacZ sequence. These primers amplified a 5.2 kb PCR product from DNA of Shox2 lacZ mice as expected if the transgene were inserted at the Shox2 genomic locus (Additional file 1: Figure S1B). Furthermore, western blotting failed to detect SHOX2 protein in lysates from E11.5 limb buds of Shox2 lacz/lacZ embryos while lysates from wild-type littermate embryos showed clear SHOX2 signal (data not shown). Therefore we conclude that the Shox2 lacZ allele is a null or severely hypomorphic allele. The precise molecular nature of the transgene insertion at its 3′ end has not yet been determined. Embryos with lacZ transgenes were stained with X-gal according to standard techniques . ImageJ was used to determine the relative size of the facial motor nucleus in lacZ stained control and NestinCre; Shox2 lacZ/flox sagittal sections at E14.5 and P0 (Figure 4t–u). Whole-mount in situ hybridization (WISH) with a riboprobe was previously described . In situ hybridization (ISH) on cryosections was previously described . The Shox2 , Shh  riboprobes have been described elsewhere. PCR primers used for generating the Ptch1 riboprobe are as follows: Fwd: GGGAGGAAATGCTGAATAAAGCC and Rev: CCAGGAGGAAGACATCATCCACAC, while the primers used for generating the Isl1, Cntn2, Tubb3, Periph, Slc18a3, Phox2b, and Slit2 riboprobes were obtained from the Allen brain atlas website (http://www.brain-map.org). DIG labeled riboprobes were detected with an AP-conjugated anti-DIG antibody (Roche) and BM Purple AP (Roche) was used as the color development substrate. All samples/slides used for comparisons were processed together. Following staining, tissue sections were mounted using Aqua Poly/Mount (Polysciences Inc.). ISH images were taken with a Leica MZ12.5 stereomicroscope using the associated Leica software. Brightness and/or contrast of the entire image was adjusted using Adobe Photoshop CS5.1 if deemed appropriate. Dissected embryos and postnatal brains were placed in ice-cold PBS, and fixed in 4% paraformaldehyde (PFA) overnight at 4°C. The tissue was washed in PBS and equilibrated in 30% sucrose/PBS overnight at 4°C. Both embryos and postnatal brains were embedded in Tissue Freezing Medium (TFM, Triangle Biomedical Sciences) and cryosectioned (16–20 μm sections). For immunohistochemistry (IHC), cryosections were rehydrated in PBS, washed with PBT (0.1% Triton-X), blocked using 5% normal goat serum (NGS) for 2 h at room temperature, and exposed to anti-active Caspase-3 (1:400, BD Pharmingen or 1:500, Promega) at 4°C overnight. Slides were then washed with PBT and exposed to secondary antibody (1:200, alexa 488 goat-anti-rabbit, Life Technologies) for 2 h at room temperature. Sections were mounted using Aqua Poly/Mount (Polysciences Inc.). Fluorescent IHC images were captured on a Zeiss LSM710 confocal microscope. Antibodies recognizing neurofilaments (2H3) were used to visualize nerves in embryos or postnatal day 0 (P0) pup heads (skin was removed at P0). Samples were fixed at least 4 h in Dent’s fixative (4:1, Methanol:DMSO). Embryos and P0 heads were processed according to standard techniques previously described . The 2H3 antibody was developed by T. Jessell/J. Dodd  and was obtained from the Developmental Studies Hybridoma Bank developed under the auspices of the NICHD and maintained by The University of Iowa, Department of Biology, Iowa City, IA 52242. Quantitative results for cell counts are represented by mean scores ± S.E.M. and were analyzed by two-tailed unpaired t tests using Prism 3 for Macintosh (GraphPad Software, La Jolla, CA, USA). JMR, DMK and JC conceived and designed the experiments. JMR performed the experiments and prepared the manuscript. JMR, DMK and JC edited the manuscript. All authors read and approved the final manuscript. The authors thank C. Schuurmans and N. Klenin for the α-Caspase3 antibody, S. Neufeld for the Ptch1 in situ probe, S. Abassah-Oppong and I. Skuplik for BAC RP23-105B3-lacZ mice and embryos, B. Bobick for Wnt1Cre; Shox2 +/− animals and assistance during the analysis of the Shox2 lacZ transgenic line, S. Pattar and C. Ostler for their contributions to the analysis of the Shox2 lacZ transgenic line, R. Hampton for animal care, and D. Hansen, E. Turner and T. Cox for critical discussion. J.C is supported as an Alberta Heritage Foundation for Medical Research (AHFMR) Scholar. J.M.R. is supported by fellowships from NSERC and the CIHR Training Program in Genetics, Child Development and Health at the University of Calgary. D.M.K is supported by the Canadian Institute of Health Research (CIHR). This work was supported by the Canadian Institute of Health Research (CIHR) (MOP-93562).